I made this back when we had some family coming into town to visit. The Carnegie Deli has been open since 1937 on 55th St. in New York City and quite possibly lays claim to the true, original New York Style Cheesecake. 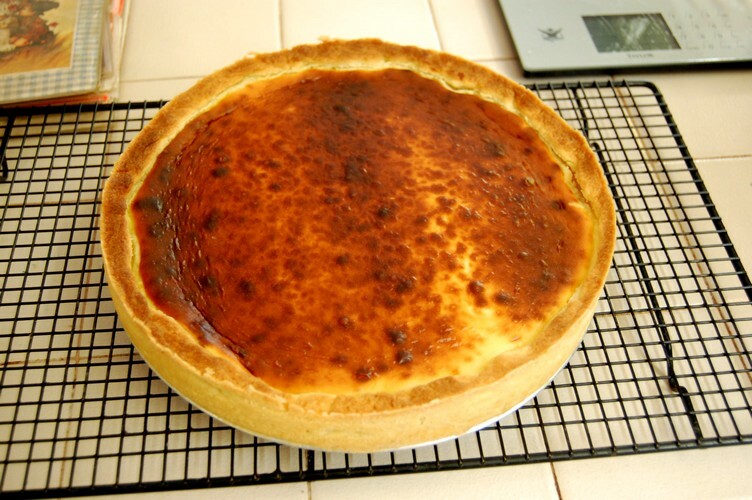 This is quite different from any other cheesecake recipe out there. Gone is the graham cracker crust and heavy consistency, this is a light citrusy cheesecake that will leave you in a state of bliss. Before we go into the recipe I will warn you just like the Carnegie Deli site does, it may take you a couple times to get this recipe right. It's very complicated for the home cook, used to opening a box and adding eggs and oil to make a cake. I say this not to dissuade you from trying it because in great risk there is great reward. I got it right the first time and you can too if you follow the directions. Make this the day before you need it, it really needs a day to mature in the refrigerator before you serve it. 1. To make the crust, place the flour, sugar, grated lemon rind, vanilla extract, egg yolk, and butter in a large mixing bowl. With your fingertips, rub the ingredients together until they are well mixed and can be gathered into a ball. Dust with a little flour, wrap in waxed paper, and refrigerate for at least 1 hour. 2. Butter and flour the bottom of a 9 inch X 2 inch spring-form pan, roll out a piece of dough to cover bottom. Dough should be as thick as for a normal sugar cookie (1/4 inch) Bake in a preheated 350 degree oven to a light brown color. Cool the pan and bottom. Butter the sides of the pan. Roll out and line the sides of the pan with more of the cookie dough. Trim excess dough from the edges. To make the filling, place the cream cheese in a large mixing bowl and beat vigorously with a wooden spoon until it is creamy and smooth (use a mixer at low speed, you don't want to incorporate air into the mix). Beat in the sugar, a few tablespoons at a time, and, when it is well incorporated, beat in the flour, lemon, vanilla, eggs and egg yolk and heavy cream. No lumps please! Preheat the oven to 485-500 degrees. Oven should be hot to enhance color. Pour the filling into the cookie dough lined pan, bake in the center of the oven until a dark brown color has been achieved. The cake should also start to rise slightly. Cool for 30 minutes and set oven to 350 degrees. 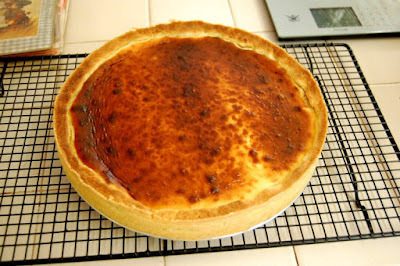 After cheesecake has cooled for 30 minutes, return the cheesecake to the oven for final baking (this procedure will set the cheesecake). 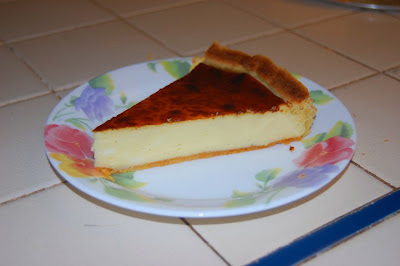 NOTE: Cheesecake is like a pudding with only eggs being used to firm the cake. When the cake is bouncy in the center and slightly risen in the middle as well as on the sides, it's finished! Baking time at 350°F will vary (usually 25 to 40 minutes) depending on your oven. Cool cheesecake in pan for at least 2 hours before trying to remove it from the pan. Refrigerate the cheesecake overnight. For best flavor, cheesecake should be served at nearly room temperature. Slice cake using a hot, wet knife; wipe blade clean between slices. NOTE: If you overbake, the cake will crack and be too firm. If you underbake, the cake will tend to be soft in the center. Despite the steep learning curve of making such a complicated recipe it actually turned out excellent. Everyone loved the texture and, yes, it's a heavy dessert but nowhere near the belly bomb that your usual cheesecake recipe is. I will make this again and I've learned a couple things along the way that will help me make this even better than the first time (i.e. Make it the day beforehand and really use a 9" pan not a 10"). I made this tonight at the request of a friend. My cheesecake looks very similar to yours. Can't wait to taste it.